Stasera a casa da M.E. v Řím, Itálie: Zarezervujte nyní! 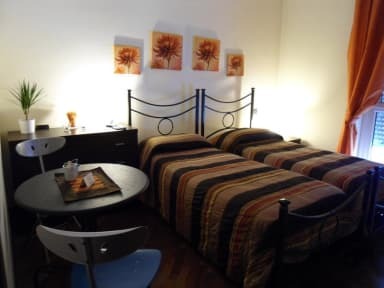 The rooms are as follow: a large double room of 25 mq with a double bed and balcony; a comfortable double room of 20 mq; a comfortable double room with two single beds, LCD TV. The cleaning service is daily. Linen and towels are included, the breakfast is Italian buffet style. The keys of the house are available to guests, to ensure their total independence. Friendliness, helpfulness and kindness are the key words that will make your stay pleasant and cheerful in this B&B.